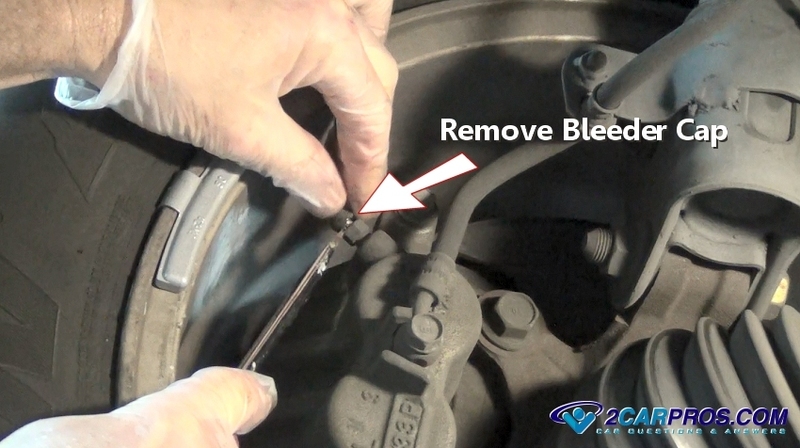 We are a team of ASE certified mechanics that have created this car brake bleed service guide. 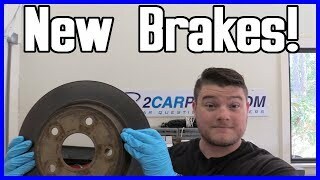 Learn what's goes wrong with your vehicle's brakes and why you need to let air out of the system. Open the caliper or wheel cylinder bleeder screws. The brake system is filled with brake fluid which is designed to work as a closed system without the presents of air. Air bubbles can get trapped in the system due to faulty seals or having the system open during repairs. This air must be removed through a process called "bleeding" which can be done using simple tools and additional brake fluid. When bleeding a brake system care must be taken to ensure all air is removed or the brakes will not work or the brake pedal will be spongy. This is due to the fact that air can be compressed where as brake fluid cannot. Like in any mechanical hydraulic system this lack of compression is what operates a cylinder or piston within an actuator such as a caliper or wheel cylinder. Moister also plays a part in the requirement of a brake bleed. In the normal operation of the brake system moisture is created in the form of condensation when the brake are heated and then cooled. Rust will then form which will create pits in the piston or cylinder bore which will cause leaks and bypass the rubber seal eventual causing brake failure. How Long Does a Brake Bleed Last? A brake bleed will typically last about 60,000 miles or it will need to be done whenever brake work is performed such as brake pad or shoe replacement. Distinctive ratings define the chemicals in which the fluids are produced such as mineral oil, ester glycol and synthetic oils. Many of these fluids are not compatible with each other. Make sure to add the manufacturers recommended fluid to your brake system. Brake fluid is corrosive so avoid accidental spillage. If you do accidentally have a spill quickly use soap and water to rinse the area clean. Always add fluid from a sealed container to avoid dirt and moisture contamination. 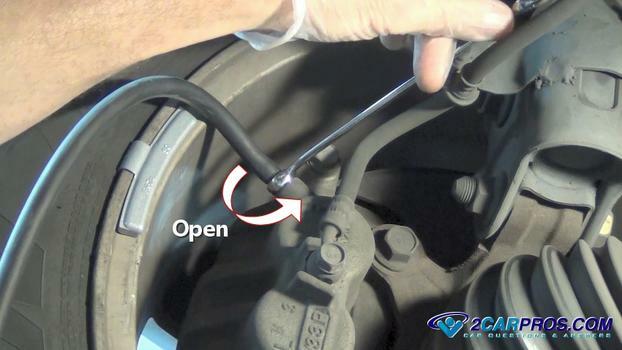 Watch the following video show a bleed and flush when completed read through the following guide to gain additional brake bleed information. This procedure is the same on almost all vehicles. Start with the vehicle on level ground. Engine off and the car lifted safely using jack stands. Check and Add Brake Fluid: Locate and identify the brake master cylinder fluid reservoir, fluid cap, lines, and fluid level sensor. 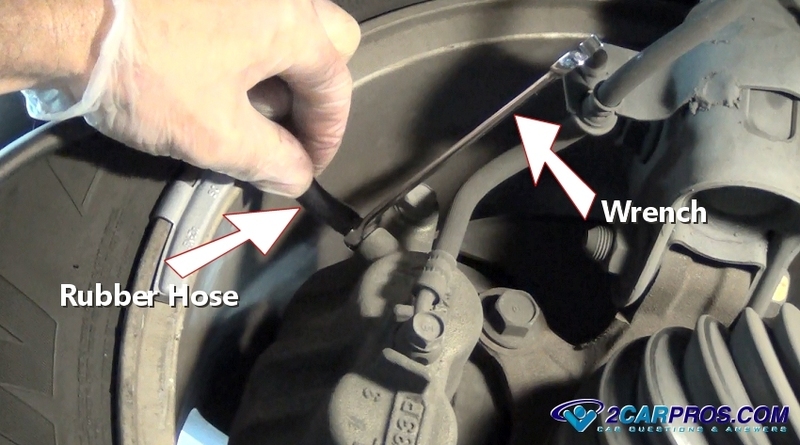 Check the master cylinder for leaks between the master and brake power booster using a flashlight and a small mirror which is a sign the master cylinder seals have failed and replacement is required. Before bleeding the brake system the master cylinder must be full of brake fluid. 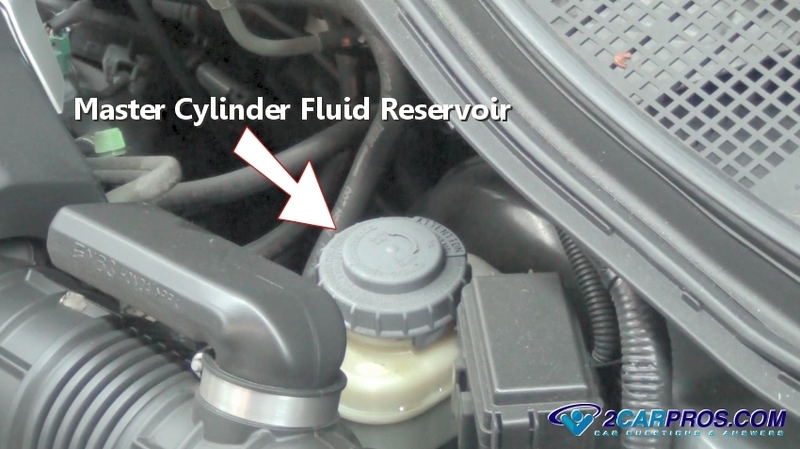 You must open and lid and look inside or check the level by looking at the side of the fluid reservoir. 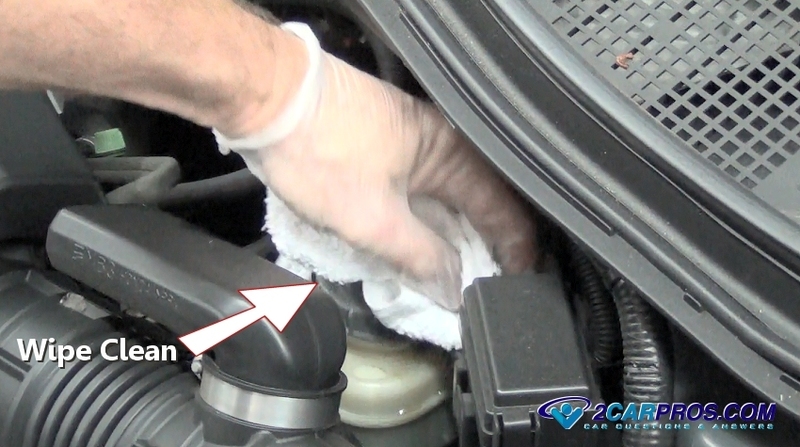 Before opening the master cylinder use a shop towel to wipe it clean. This will help keep dirt out of the reservoir which can cause seal failure and a system leak by contaminating the fluid. If fluid is needed, grasp the lid while gently lifting upward. Twist the lid counterclockwise to remove it. Some lids have a fluid level sensor that have wires attached which you can pull directly upward. Once removed wipe off any excess fluid and set it off to the side. 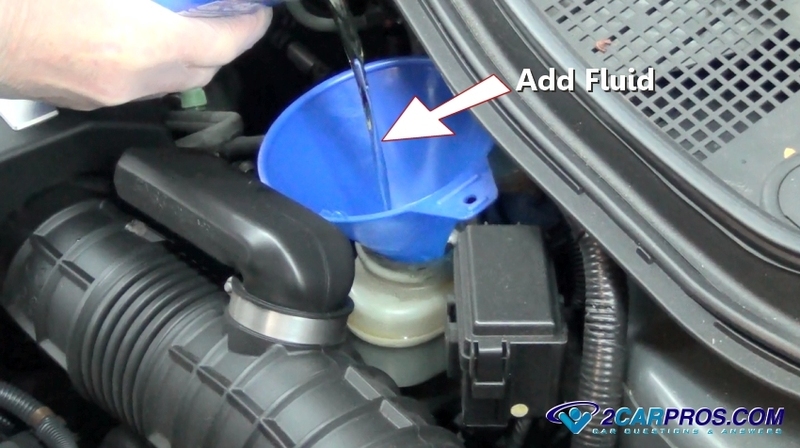 When adding brake fluids avoid spillage and carefully pour the new fluid into the reservoir. You may need to use a funnel to aid in this process. Continue adding until the fluid reaches the full line and then remove the funnel. Most systems use a DOT 3 or DOT 4 fluid but if you are not sure consult your vehicles owner's manual or it will mention the fluid type on the lid of the master. If an accidental spill occurs you should rinse the area with water once the cap has been reinstalled. 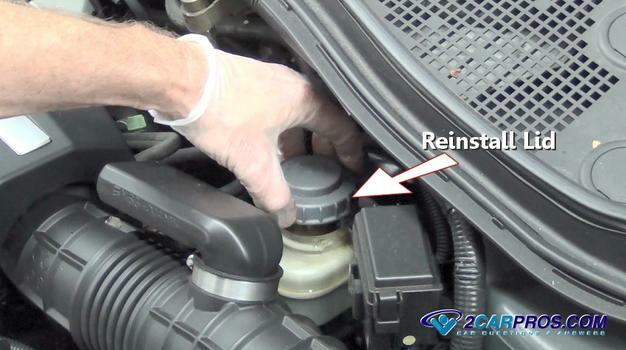 Reinstall the reservoir cap and wipe off an access fluid. You are ready to bleed the brake system. Locate Bleeder Screws and Remove Dust Caps: Locate all four brake fluid bleeder fittings located near the top of each brake caliper or wheel cylinder. These bleeders may have a dust cap over them. The system bleeder screw can be fairly tight because bleeder screws seals against a taper fit seat in the valve. When loosening apply WD40 or equivalent to aid in rust removal if needed and use a 6 point wrench or socket which is best to avoid stripping. Using a small screwdriver or pick remove the bleeder dust cap. Place it to the side to be reinstalled once the job is done. Attach Rubber Hose to Bleeder: Place a boxed end wrench over the bleeder and a rubber hose positioned onto the bleeder over the wrench. A rubber hose is helpful to avoid fluid contamination from getting onto the pads or shoes. Access fluid should be hosed off with water once the job is completed. Bleed the Brake System: Now it's time to start the bleeding process. Start with the right rear and open the first bleeder valve while the opposite end of the rubber tube is in a fluid catch container. 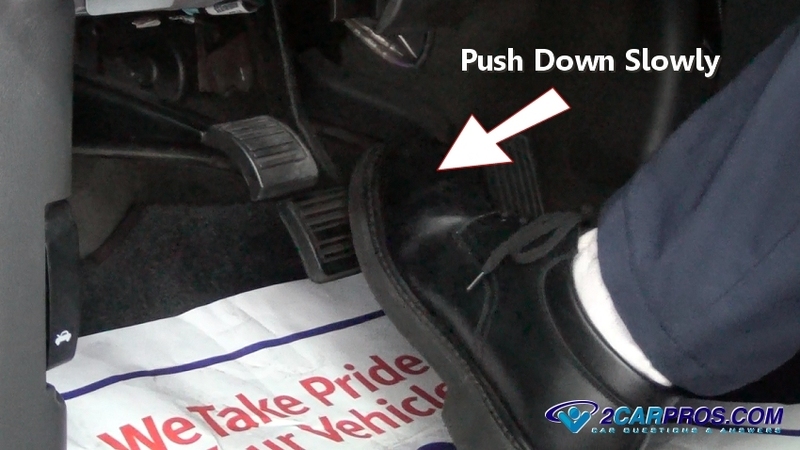 Have a helper push down on the brake pedal slowly and hold even pressure downward. Do not let up on the pedal. Fluid will then start to flow out of the bleeder and tube. Air bubbles will be in with the fluid stream if air is present in the system. While maintaining pressure on the pedal and as the fluid flow starts to slow down tighten the bleeder valve. Do not allow the pedal to come upward while the valve is open or it will such air back into the system and you will need to start the bleeding process all over again. 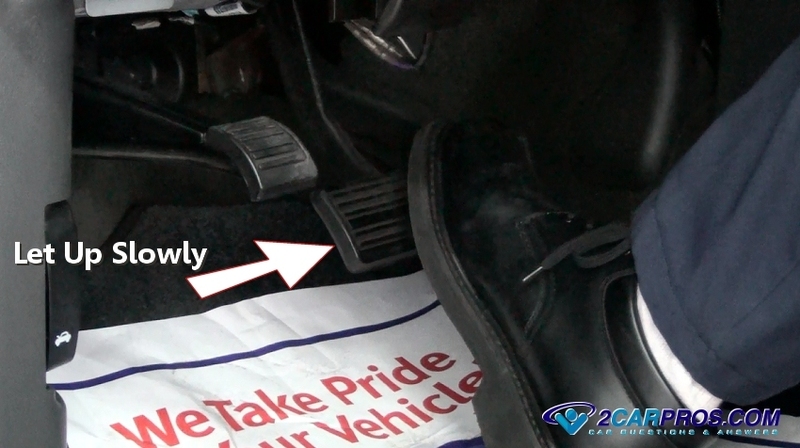 Once the bleeder valve is closed lift up on the brake pedal slowly until your foot comes off of the brake pedal pad. 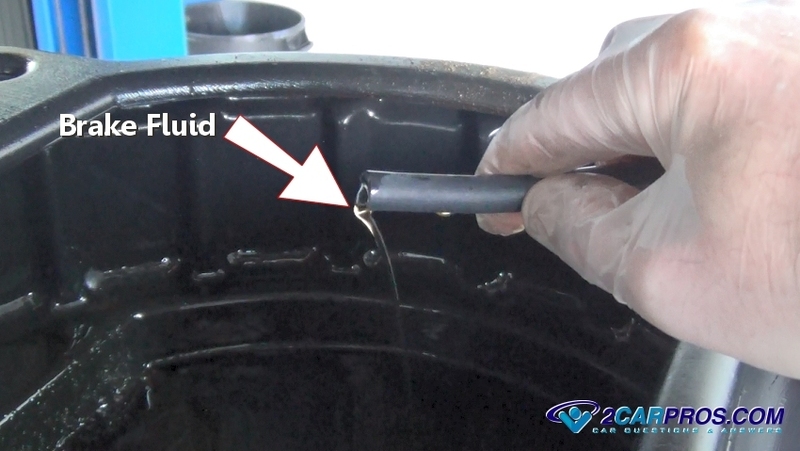 Continue this process at each wheel until fluid is present with no air bubbles being expelled from the bleeder valve or hose, this can take two or three times. Now one corner of the system is bled. Continue this operation on the left rear. Then head to the right front and then finish with the left front. Never pump the brake pedal as this will cause additional air to get into the system. There is a very small orifice inside of the master cylinder that allows new fluid down into the master cylinder chamber. If you pump the brake pedal can cause air to be sucked in through the seals of the master cylinder. While bleeding the system observe brake fluid level in the reservoir and refill as needed. 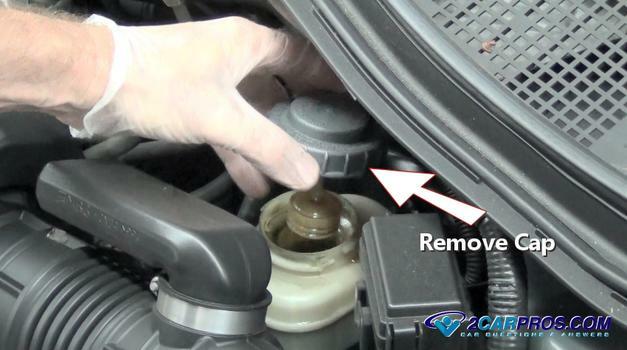 Add additional fluid to keep the master cylinder full. Do not allow the master to become empty or air will be pumped into the system. 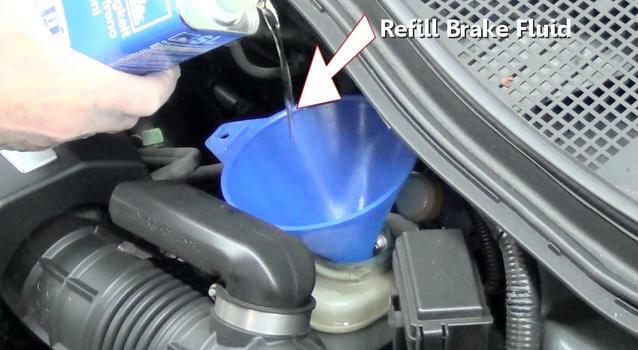 Refill the Brake Fluid: Once the job is done refill the brake fluid to the full line of the reservoir and reinstall the lid. Using a shop towel wipe any spilled fluid and rinse the area with water if needed. Then start the engine and check brake pedal operation which should be firm toward the top of its travel. If the brake pedal is on the floor or spongy there is air still in the system or another problem. This could mean the brake shoes are out of adjustment. 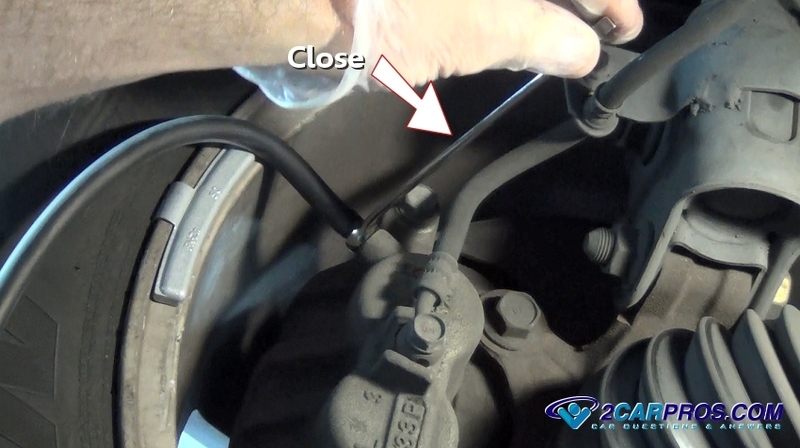 The master cylinder is bypassing internally or the system has a leak. 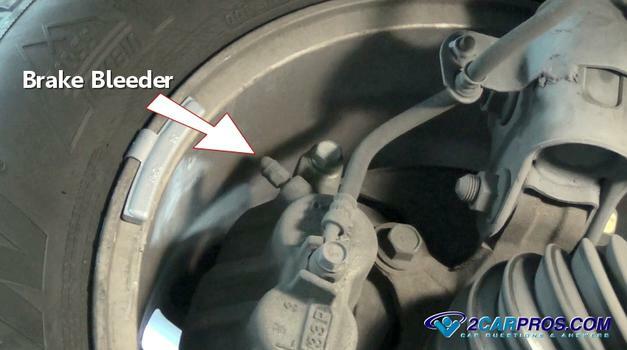 If you have any questions about brake bleeding please visit our forum. If you need car repair advice, please ask our community of mechanics who are happy to help. Our service is always 100% free. We hope you enjoyed this guide. We are creating a full set of car repair guides. Please subscribe to our 2CarPros YouTube channel and check back often for new videos which are uploaded almost everyday.